At Del Mar Plastic Surgery, we are dedicated to providing top-of-the-line plastic surgery procedures with a personal touch. 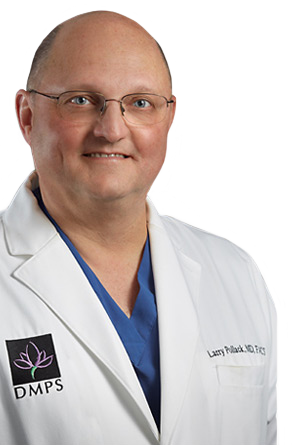 Dr. Larry Pollack’s main goal as an ABPS board-certified plastic surgeon is to treat his patients with the best care possible and provide them with outstanding results. He is past Chief of Surgery at Sharp Memorial Hospital and has been performing plastic surgery in the San Diego area for over 20 years. Dr. Pollack and his staff combine state-of-the-art technology with customized care to ensure that each patient’s experience is as safe and positive as possible. Consecutively in 2014 and 2015, Dr. Pollack was granted the Women’s Choice Award for Outstanding Patient Experience. Del Mar Plastic Surgery offers a variety of surgical and nonsurgical procedures, and Dr. Pollack specializes in breast augmentation, tummy tuck, and body surgery. His kind and friendly staff are here to answer any questions you have and support you in your transformation from start to finish. It can be difficult for women to regain the bodies they had before pregnancy. Sometimes no amount of exercise can remove excess skin and fat or tighten stretched muscles. The mommy makeover combines several procedures to help return a woman's body back to how it looked and felt before her baby. It is common for women to find that their post-pregnancy breasts have begun to sag, especially if they breastfed. Sagging breasts, also called breast ptosis, may be perfectly fine in size but simply lack the perk of the pre-pregnancy breast. Breast lift surgery can correct ptosis and lift the breasts into a pleasing position by removing excess skin and reshaping the breasts. After pregnancy and nursing, many women find that their breasts are smaller than they were pre-pregnancy, and the breasts may even appear deflated. Breast augmentation surgery improves breast size and shape. Implants are inserted into the breasts, giving back volume and a youthful shape. During pregnancy, the abdominal muscles and skin are stretched to make room for the growing baby. After pregnancy, it may be impossible to attain your abdomen’s original firmness. No amount of exercise can restore your skin’s elasticity or repair a weak abdominal wall. The tummy tuck procedure removes excess skin and tightens the abdominal muscles to provide a firm abdominal region. The body generally gains a lot of fat during pregnancy. No matter how intensely you work out after delivering a baby, stubborn fat deposits often remain. Common problem areas include the thighs, hips, tummy, and bra line. Liposuction helps rid the body of excess fat that working out alone cannot, and in the process it creates a slim look and more pleasing body contours. Dr. Pollack is proud to announce the use of Crisalix, a computer imaging technology that allows you to view your projected results before surgery. Using standard 2D photos of you, the Crisalix program creates a 3D image of your body that Dr. Pollack can manipulate to show you the expected results of your desired procedure(s). Crisalix is ideal for showcasing your future breast augmentation results, but it can be used to simulate many other procedures as well. This new technology helps both you and Dr. Pollack to see the potential of your fabulous new body before you ever undergo surgery.